On 15 April 2019, just before 18:50 CEST, a fire broke out beneath the roof of Notre-Dame Cathedral in Paris. By the time the fire was extinguished fifteen hours later, the building's spire and roof had collapsed and its interior, upper walls, and windows had been severely damaged; even more extensive damage to the interior was prevented by the stone vaulted ceiling, which largely contained the burning roof as it collapsed. Many works of art and other treasures were evacuated early in the emergency, but many others were damaged or destroyed. The cathedral's two pipe organs, and its three 13th-century rose windows, suffered little or no damage. President Emmanuel Macron promised the country would restore the cathedral and launched a fundraising campaign which brought in pledges of €800 million within 24 hours. It has been estimated that restoration could require twenty years or more. Construction of the cathedral of Notre-Dame de Paris ("Our Lady of Paris") began in the 12th century, using stonework for the walls and vault and wood for the main roofs and spire. 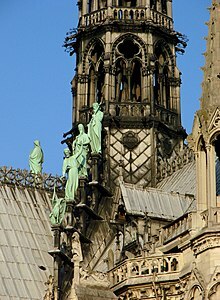 The original flèche (spire) was damaged by wind and removed between 1786 and 1791; a new spire, in oak covered with lead and designed by Eugène Emmanuel Viollet-le-Duc, was added in the 19th century. The cathedral was listed as part of the "Paris, Banks of the Seine" UNESCO World Heritage Site in 1991. In recent years the cathedral suffered significantly from crumbling stonework, primarily due to environmental pollution, as acid rain attacks limestone. In 2014, the Ministry of Culture estimated the cost of the renovation work needed by the cathedral at €150 million. In 2016, the Archdiocese of Paris launched an appeal to raise €100 million over the following five to ten years to meet the costs of maintenance and restoration. At the time of the fire, it was undergoing renovations on the spire, estimated to cost €6 million. Steel scaffolding had been erected around the roofs. The Paris prosecutor originally said the fire started in the cathedral's attic at around 18:50 CEST, when the cathedral was open to the public. At about 18:20, security guards first heard the fire alarm and began evacuating the cathedral but did not see a fire until 18:43, when either the alarm sounded again or a second alarm sounded. A Mass was underway since 18:15. The cathedral was evacuated in an orderly manner within minutes. According to some of those at the scene, the doors of the cathedral were abruptly closed on them and white smoke began rising from the roof. The smoke turned black before flames appeared from the spire, then yellow. Police quickly evacuated the Île de la Cité. The fire was primarily fought from the inside, in line with common French fire-fighting practice. Attacking the fire from the outside risked damaging the interior by deflecting flames and hot gases (at temperatures up to 800 °C or 1,470 °F) inwards. Twenty firefighters climbed inside the two towers. Deluge guns from ground-based vehicles were carefully used to douse the fire while avoiding further damage to the building. Following the plans the fire department made for such an emergency, boats were rapidly deployed on the Seine river to pump the water. Water dropped from the air was not used, as its impact could have contributed to structural damage and heated stone can crack if suddenly cooled. Helicopters were not used because of dangerous updrafts but drones were used for visual and thermal imaging, and robots were used for visual imaging and directing water streams. More than 400 firefighters were engaged; another hundred worked to evacuate artefacts. Along with the high temperatures of the fire, molten lead falling from the roof also posed a hazard. No one was killed, but one firefighter and two police officers were injured. Most of the fire was extinguished by 23:30 CEST, and was considered completely extinguished after about twelve hours. 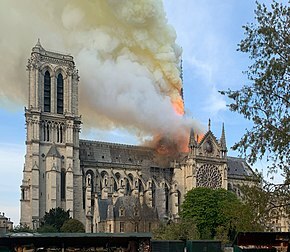 The Paris fire chief said the bell towers and other structural elements would have likely failed had the fire burned for another 30 minutes. Within an hour of flames being seen, the lead-clad timber roof of the cathedral, including its timber central spire, was engulfed, causing it to collapse onto the masonry of the cathedral's ceiling vault. The oak section of the church's roof was destroyed. Much of the timber structure that burned was the cathedral's "forest": wooden roof trusses, made from approximately 21 hectares (0.21 km2; 52 acres) of oak trees cut down for the construction of the cathedral; each individual tree contributed a single beam. The older timbers dated from the early 13th century. Approximately 200 tonnes (220 short tons) of lead sheet sat atop the timber framing to complete the cathedral's roof. This lead mostly melted during the fire. There was fear that the collapsing timber roof would damage the stone vaulting that forms the ceiling of the cathedral and supports the walls from the inside (the flying buttresses support them from the outside). If the masonry vault had collapsed, the damage would have been significantly worse; there were fears that the entire structure would be destroyed. Although the vaulting was intended by the medieval designers to protect the interior from roof fires, this is not always effective; similar cathedrals have been completely destroyed by fires in the past. Lead melting down onto the vaults could have unbalanced them, causing collapse. The vaults mostly remained intact and continued to support the burning roof timbers after they collapsed. A few sections fell, leaving holes in the vault, through which the fire could be seen from below. Embers fell through the holes and landed on the marble floor and debris from the collapse. Around 23:15 CEST, officials reported that the fire had weakened and that both towers were safe. The primary structure, including both of the towers, and one-third of the roof remained standing. Most of the stone vaulted ceiling remained in place, but sections had collapsed, allowing debris to fall through. Inspectors later found some weaknesses in the surviving structure, and evacuated an adjacent row of apartment houses on the Rue du Cloître as a precaution. All three of the church's 13th-century rose windows survived, although there was damage to some of the 19th-century windows. The cathedral contained a large number of artworks, religious artifacts, and other irreplaceable treasures. These included a crown of thorns said to be the one Jesus wore prior to his crucifixion, a purported piece of the cross on which Jesus was crucified, the Tunic of St. Louis, a much-rebuilt pipe organ by Aristide Cavaillé-Coll, stained-glass windows, the Virgin of Paris statue of Mary and the baby Jesus, and bronze statues of the twelve Apostles. Some contents were evacuated by a human chain of emergency workers and civil servants. Many valuables that were not removed survived, but the state of many remains unknown. Some of the artwork had been removed prior to the renovations, whilst most of the sacred relics were held in the cathedral's sacristy[further explanation needed] and thought to be safe. Several pews were destroyed and the sculpted arches[further explanation needed] were blackened by smoke, though the church's main cross and altar survived, along with the statues surrounding it. Some paintings, apparently only smoke-damaged, are expected to be transported to the Louvre for restoration. A number of statues, including those of the twelve Apostles at the base of the spire, had been removed in preparation for renovations. The rooster reliquary atop the spire was found, damaged but not destroyed, among the debris. Some lead joints in some of the 19th-century stained-glass windows melted, but the three major rose windows, dating to the 12th and 13th centuries, were undamaged; one is unstable and may have to be dismantled for safekeeping. The two pipe organs were not significantly damaged. Some of the cathedral bells that hung in the towers during the fire were preserved, including the bourdon. The liturgical treasury of the cathedral and the "grands Mays" monumental tablets were evacuated during the fire. Within hours, the Paris prosecutor's office had opened an investigation, led by the Paris Region Judicial Police. The investigation most strongly suspected a case of "accidental destruction by fire", but had not ruled anything out. On 16 April, the Paris prosecutor said that nothing his office had learned suggested a deliberate act. President Macron postponed a major speech planned for the evening after news of the fire broke. He had been due to give a televised address to outline measures he plans to take following nationwide public debates held in response to the yellow vests movement; instead, he travelled to the site of the blaze, where he gave a brief address to the French people. Multiple groups gathered in vigils for Notre-Dame. The mayor of Paris, Anne Hidalgo, described the fire as "terrible". The fire has been compared to the similar 1992 Windsor Castle fire and the Uppark fire, among others, and has raised old questions about the safety of similar structures and the techniques used to restore them. Numerous world religious leaders and governments expressed their sorrow and extended condolences to the French people and authorities. [b] The Archbishop of Paris, Michel Aupetit, tweeted on the 15th: "To all the priests of Paris: The firefighters are still fighting to save the towers of Notre-Dame de Paris. The frame, the roof, and the spire are consumed. Let us pray. If you wish, you may ring the bells of your churches as an invitation to prayer. "[c] A team of UNESCO experts prepared to conduct a damage assessment, and the international community of craftsmen and experts working in stained glass and stone masonry offered assistance, including the caretakers of York Minster, which is a similar sized and aged cathedral, and which suffered a similarly serious fire in 1984. Cardinal Gianfranco Ravasi, the president of the Pontifical Council for Culture, offered the use of the expertise of the Vatican Museums in reconstruction. Through the night of 15 April and into the next day, citizens and visitors to Paris gathered along the Seine to hold vigils, pray, and sing prayers such as the Hail Mary to the damaged cathedral. During the fire, one of the specialists involved in the restoration work expressed horror at the burning of the cathedral, and the possibility that "In wanting to give her a second youth, we have perhaps destroyed her." On the night of the fire, President Emmanuel Macron announced that the cathedral, which is owned by the state, would be rebuilt, and launched an international fundraiser the next day. The cathedral itself, as well as several other historical buildings in France, was not insured due to cost constraints, leaving the costs to rebuild to the state. The heritage conservation organisation Fondation du Patrimoine estimated the damage in the hundreds of millions of euros; European art insurers stated the cost would be similar to ongoing renovations of the Palace of Westminster in London, which currently is estimated around €7 billion. This cost does not include damage to any of the artwork or artefacts within the cathedral; art insurers said any pieces on loan from other museums would have likely been insured, but the works owned by the cathedral would not have been insurable. While Macron desired to have the cathedral rebuilt in five years, in time for the 2024 Olympic Games in Paris, architects expect the work could take from twenty to forty years, as any new structure would need to balance restoring the look of the original building, using wood and stone sourced from the same regions used in the original construction, with the structural reinforcement required for preventing a similar disaster in the future. 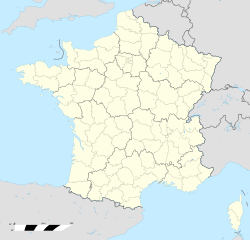 The Île-de-France region announced it would allocate €10 million, and the City of Paris declared it would make €50 million available. Twelve hours after the fire started, over €900 million had been pledged by a number of people, companies, and institutions for the cathedral's reconstruction. This page is based on the Wikipedia article Notre-Dame de Paris fire; it is used under the Creative Commons Attribution-ShareAlike 3.0 Unported License (CC-BY-SA). You may redistribute it, verbatim or modified, providing that you comply with the terms of the CC-BY-SA.